Elements Applied: Dried rootstock is applied in herbal medicine. Active Components: Among the main components berberine, hydrastine, and canadine (in smaller concentration) are mentioned. Berberine, the concentration of which in the rootstock varies from ½ to 6 percent, is the most investigated one from the entire range of alkaloids present in the herb. It has been revealed to act as an antibiotic against a wide variety of pathogens, like Entomeba histolytica, Salmonella typhi, E.coli, and Chlamydia species. History: Goldenseal was applied by early American residents as a remedy for inflammations and irritations in the mucous tissues of urinary, digestive, and respiratory systems. It was also a local ointment for eye and skin infections. Due to its antibacterial capacity, goldenseal has been applied to treat diarrhea, vaginal conditions, and respiratory diseases, induced by infections. 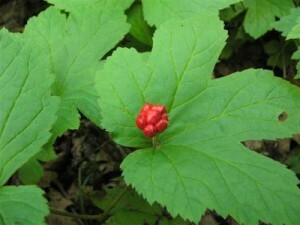 Commonly, goldenseal is prescribed in conjunction with echinacea to relieve influenza and colds. Used For: The herb is known to relieve constipation, boost metabolic rates, purify the bowels, treat eye infections, prevent the chronic conditions, reduce fevers, and promote urination. The range of conditions in which the herb is applied includes: urinary infections, chronic ear incfections, Crohn’s disease, sore throats and common colds. According to Jethro Kloss, the plant should be valued as the most potent of any existent herbal remedies. He treats it as a panacea for human diseases. The plant is especially useful for digestive disorders, like liver conditions, severe inflammations, and stomach diseases. It is capable of taking a positive action on mucous tissues and membranes to which it’s applied. Goldenseal is beneficial for sickness associated with pregnancy, skin conditions, erysipelas, ringworm, eczema, inflammations, and open sores. To treat heart conditions and promote sufficient heart tone the herb is mixed with red pepper and skullcap. Additionally, the plant is used for severe throat conditions, like diphtheria, and tonsillitis. It may be applied for recurrent intestinal inflammations, and other inflammatory conditions, as well as enhance digestive function and boost appetite. Additional Info: The herb is indigenous to eastern areas of North America and is specially raised in Washington and Oregon. The rootstock and the root are applied in herbal medicine. Preparation and Intake: The majority of cases can be aided by a daily dose 4-6 grams of goldenseal root powder in capsules or tablets. In form of liquid extract the plant is applied at a dose of 4-6 ml. Prolonged application is recommended only for a period of three weeks, after which period there should be an interval of two weeks at least. Tea made of goldenseal powder, or goldenseal tincture may relieve sore throat. Safety: If used at the suggested dose, the herb is considered safe. Still, in common with other alkaloid-based herbs, goldenseal may cause digestive dysfunction or a nervous disorder, if used in large quantities. Pregnant or breastfeeding women should avoid using the herb.